Beauty Sketch by Jacq: A Jesuit from Argentina? Yes Please! If I'm not wrong, out of the 432 blog posts published before this one, I have not made one non-beauty related. Excluding those un-avoidable random facts tags, of course. So I beg your pardon if you find this piece of sharing un-interesting. I am baptised when I was a few months old, by a Jesuit priest, whom my dad has known for years. Jesuits are some of the most knowledgeable and loyal servants in the Catholic Church. I admire them dearly. Sometimes when I meditate on 'vocation', I'd think if I were born a male, Jesuit I might become one. That didn't happen, and now I choose another vocation, the matrimony. So, today, I woke up at 6 in the morning (local/Beijing time) because I faintly heard the words 'white smoke' from the radio next door. I am glad that I did! I hurried reading news after news and watching videos on the Argentine Former Cardinal Jorge Mario Bergoglio. What do we know about Pope Francis? You can probably find most facts about him online, e.g. wikipedia. The reason he chose to call himself Francis, is to honour St. Francis of Assisi. 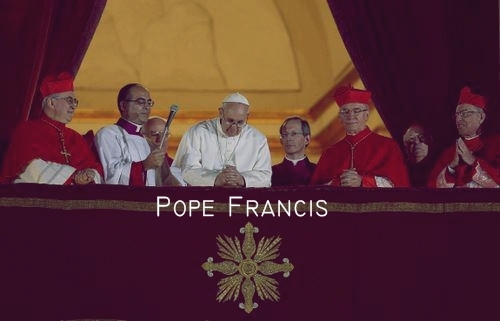 He is the first non-European pope in the modern era. He is the first pope from the Americas. He is the first Francis. Below is Pope Francis' first words, English translation fully quoted from Kung Kao Po, our local Catholic news agency. You can also view the video by Rome Reports. Can't you tell I am loving Pope Francis? I'm loving him as much as I could possibly love any other pope, really.